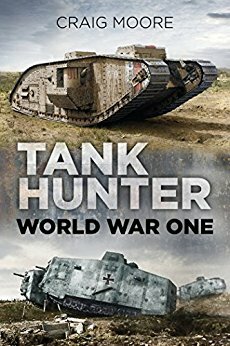 The Whippet tank is what its name implies; a Whippet, a breed of fast hunting dogs used for chasing prey down and catching it. ‘Fast’ here being comparative. 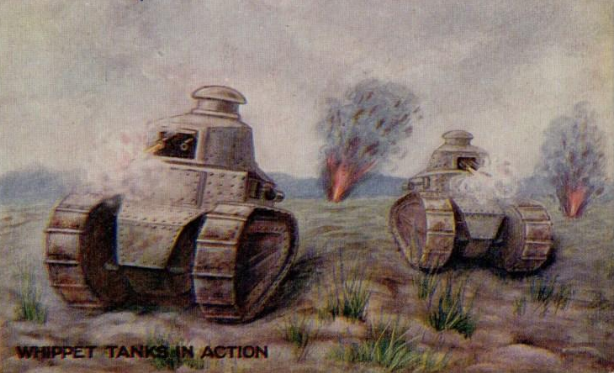 Compared to the much larger and heavier British tanks of WW1, the famous ‘rhomboid’ shaped machines, these really were Whippets. 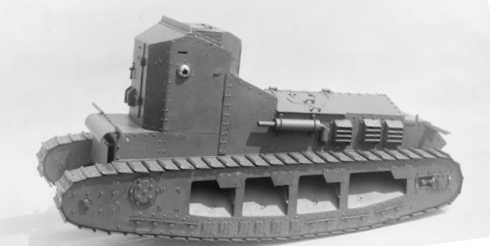 Designed to effectively emulate the role of scout and cavalry, push ahead, harass the enemy and to use machine guns to sow confusion, the Whippet was intended to work with those heavier tanks and not to replace them. The tests at Oldbury of the new Whippet design had met with approval. Some 200 Whippets were soon placed on order with this new polygonal style upper body. The goal was to have them delivered to France by the end of July 1917 and a further order of 200 was placed that summer which was canceled about 4 months later. 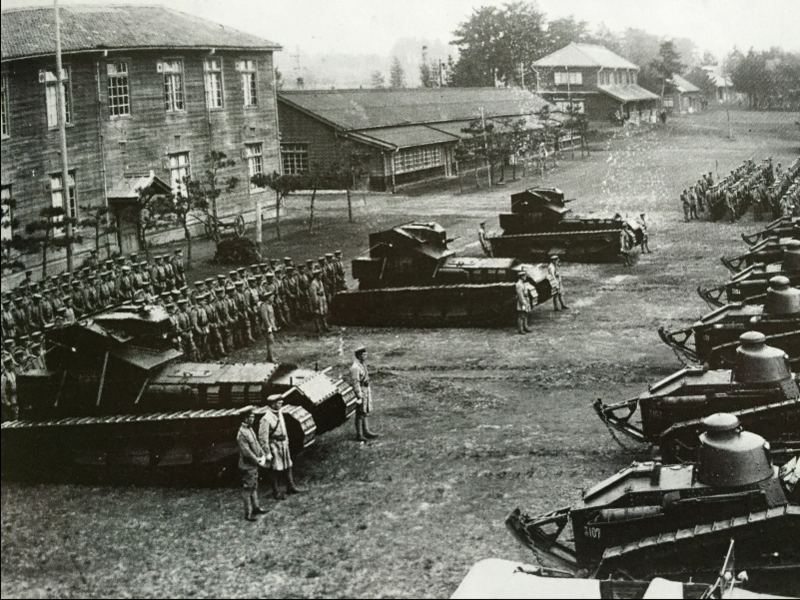 Of these first 200 machines, only 166 had been completed by the summer of 1918 and it was into the autumn before the remaining 34 arrived. 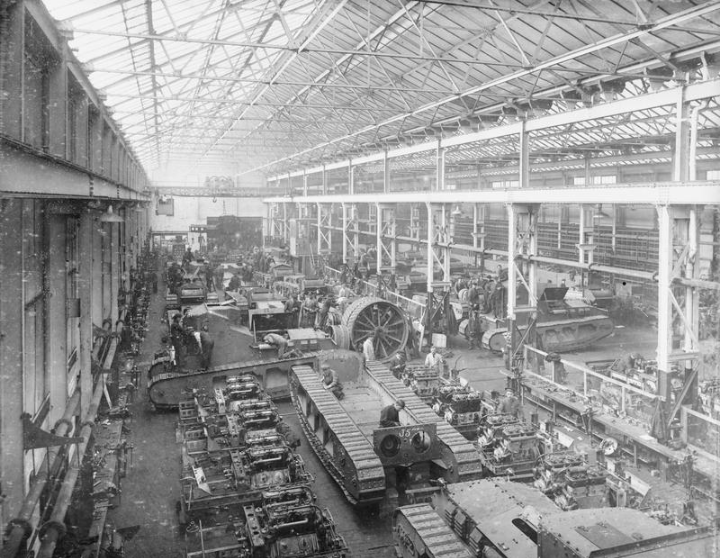 All 200 vehicles were assembled at the Wellington Foundry works of William Foster and Co. Ltd. The name ‘Tritton Chaser’ was gone. This was now ‘The Whippet’ or officially the ‘Medium Mark A’. They were to face the trials of combat very soon after they arrived in France. 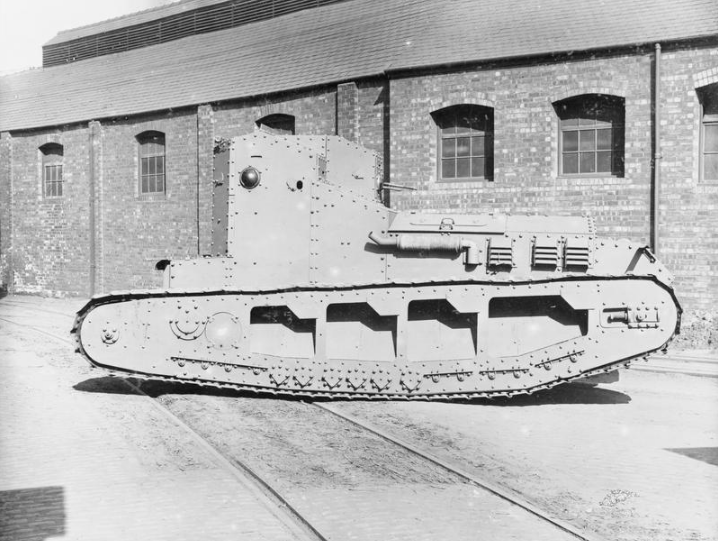 The Tritton Chaser had morphed into a similarly looking but larger ‘Whippet’ tank. This production vehicle was noticeably different to the rebuilt Chaser. 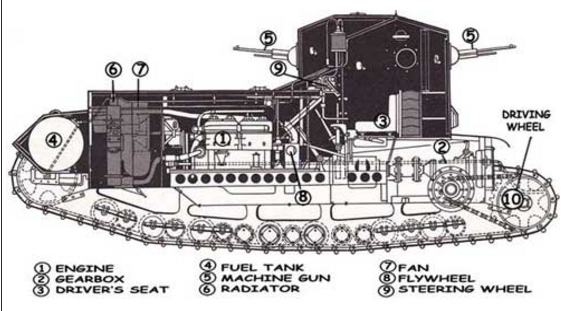 The basic shape was the same but that curved exposed front fuel tank now had an angled armored cover. The distinctive open mud chutes on the side were slightly redesigned and there were now four roughly rectangular shaped openings. A fifth small circular one at the rear behind the fourth mudchute was for accessing the drive chain and the covering plate is sometimes missing in photographs. Another change was that those 16 Skefco roller bearings were now reduced to just 6 on each side. They bore most of the most of the weight from the tank. Additional front metal bracket added to some Whippets the purpose of which is unclear. These 200 vehicles were each assigned a serial number from A200 up to A399. The first Whippets to arrive in France were delivered in December 1917 and were involved in combat from then on. 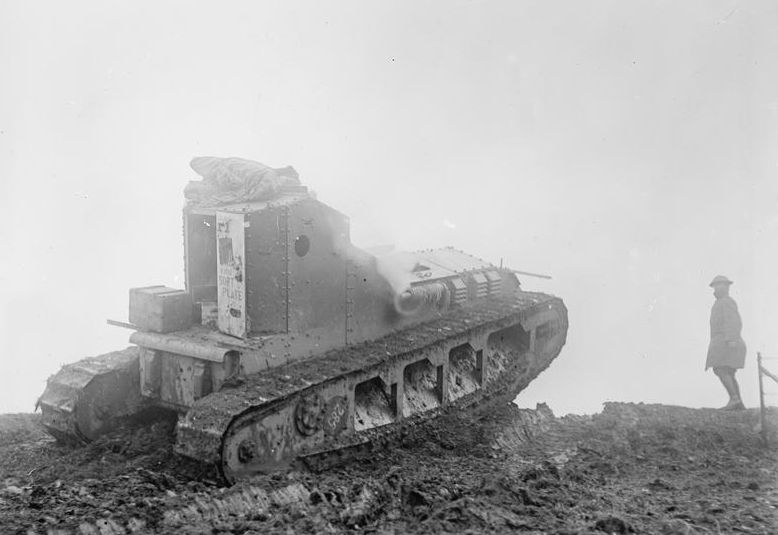 In April 1918, Tritton visited the front once more and discussed the Whippet and possible improvement which may have been mainly connected to the conditions inside the vehicle which were unpleasant. 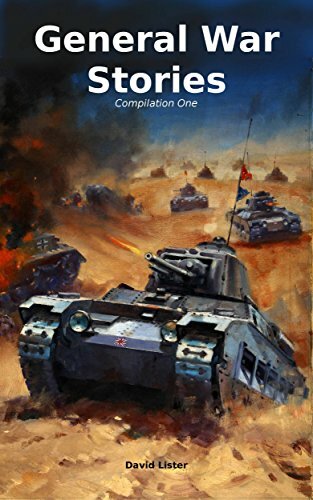 The heat and fumes from the engine, the fumes from the machine guns all meant that the vehicle could become stiflingly hot and tiring for the crews to operate. On top of this, the exhaust was vented on the side of the vehicle ahead of the crew space meaning, as it traveled forwards, exhaust gas could both obscure the view of the crew and re-enter the vehicle making the conditions inside even worse. The only relief from these conditions would be to open the small roof hatch which was intended for the commander to use when guiding the vehicle or the large rear door. 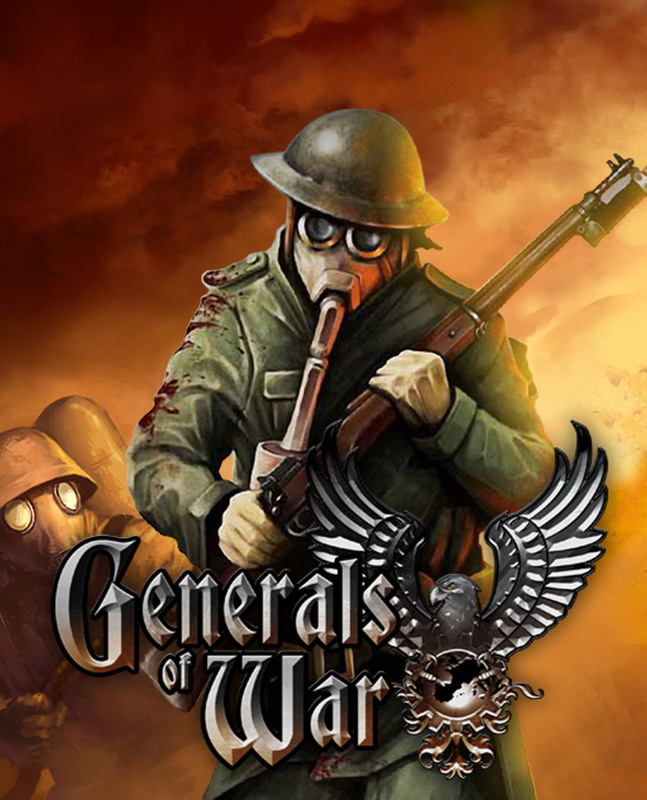 Obviously keeping those open in combat was extremely hazardous. 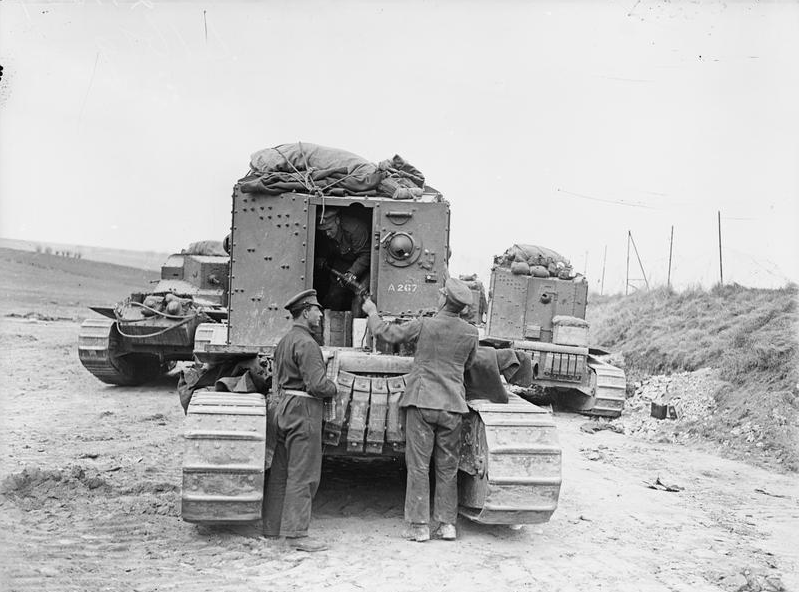 In service, some Whippets were fitted with large wooden stowage boxes on the back supported by an angled steel strap fastened to the cab of the tank. These boxes would provide some much needed stowage for the crew and may also have helped in carrying additional cans of petrol. Many vehicles in service are festooned with petrol cans to extend the operational range of the vehicle. The Medium Mark A Whippet was to see its first combat on the 26th March 1918 at Mailly-Maillet, north of Albert, France. It had been considered to send Whippets to the Army in Palestine too but that didn’t happen. 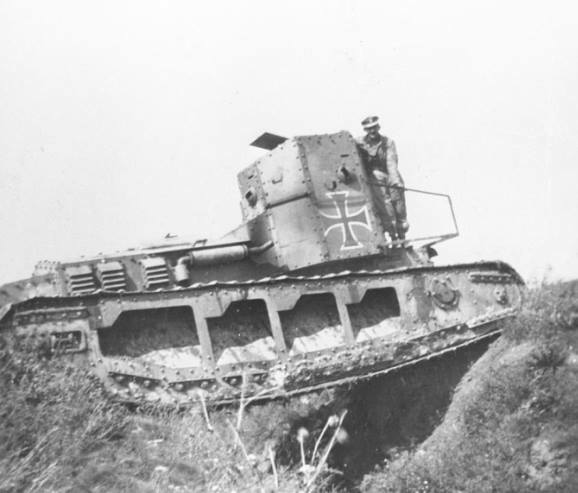 The Whippet tank was to enjoy some notable combat actions most famously the actions of Musical Box (A344), and Caeser II (A259). On the 8th August 1918, near to the town of Villers-Brettoneux, France, Whippet A344 known as Musical Box was about to become a legend. 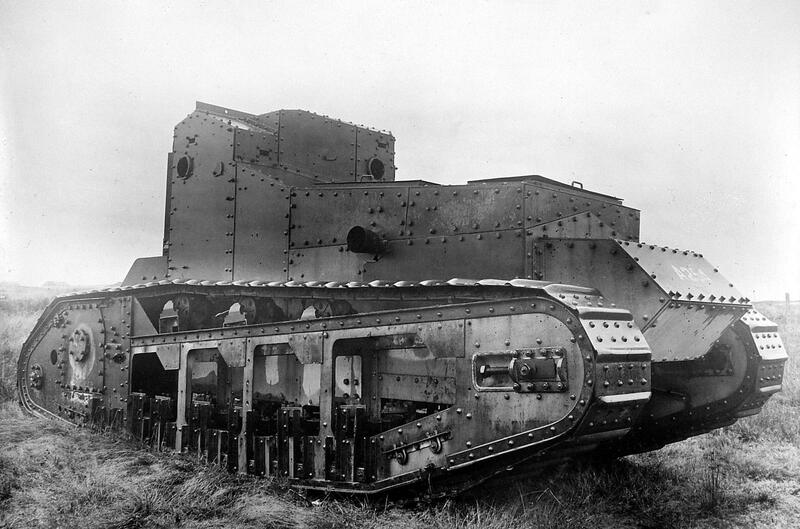 In command of the tank was Lieutenant C.B. Arnold. It began an attack with 7 other vehicles, which for one reason or another being stuck or suffering mechanical failure. 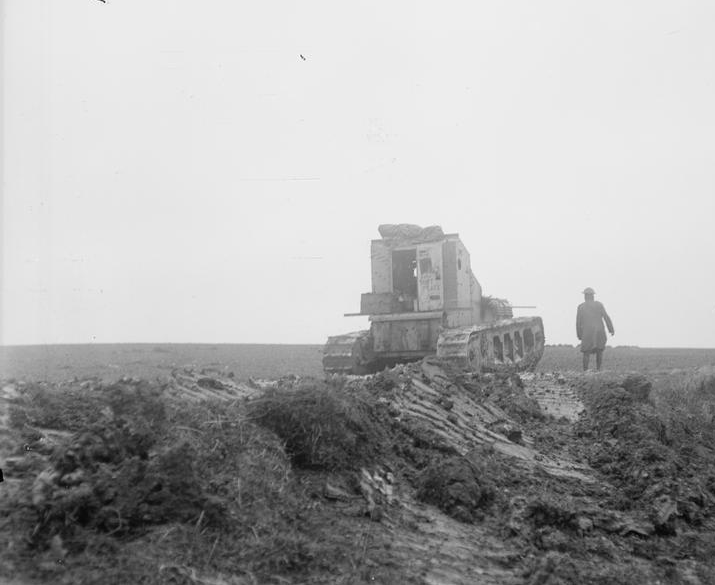 This left Musical Box on her own to support some Australian Infantry and Mk.V tanks attacking the German lines. Musical Box attacked a battery of German field guns, which was somewhat suicidal at best but scattered the Germans with its machine guns allowing the Australian infantry to advance into the German position. Lt. Arnold pressed on regardless for several hours resulting in the dispersal of a large segment of a German infantry division, a transport column and even an observation balloon. The combat had caused the cans of petrol carried on Musical Box to be perforated leaking petrol dangerously into the tank so much so the crew were having to wear their respirators. Eventually, Muscial Box was crippled and set on fire by a direct hit from a German gun and the crew bailed out. 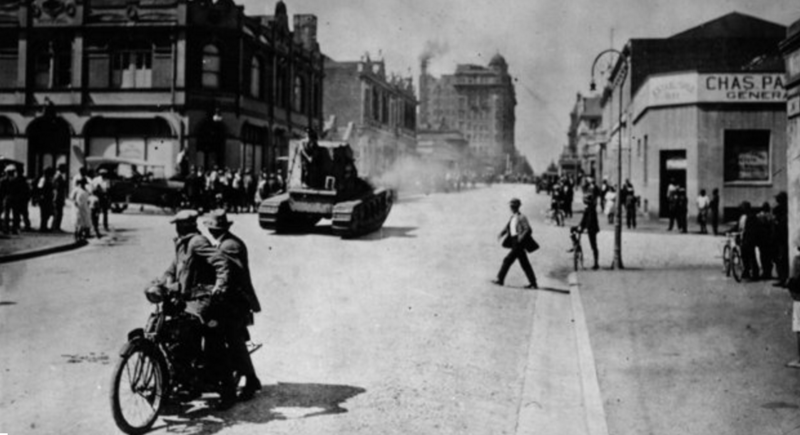 The driver was shot but he and the machine gunner were captured. Lt. Arnold survived the war as a POW having inflicted a loss on the Germans far out of proportion to what could be expected. Burnt out remains of A344 Musical Box pictured the day after the incredible fight with Australian soldiers of the 15th Brigade and some German prisoners. 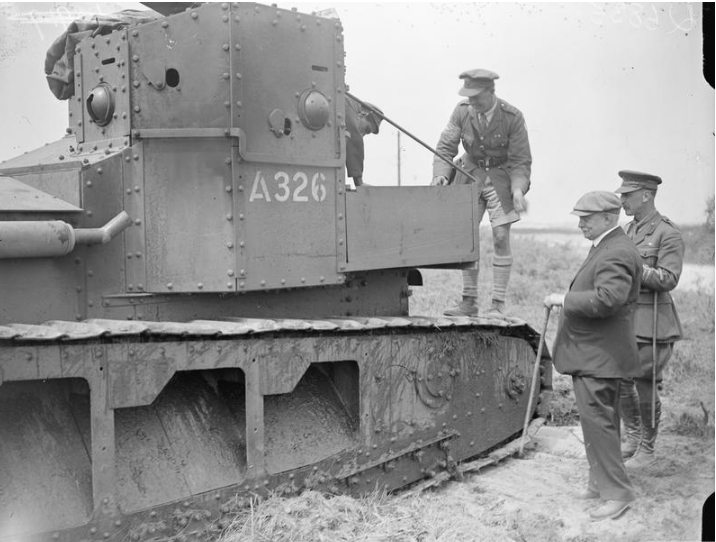 On the 29th August 1918, Caeser II (now preserved at the Bovington Tank Museum), commanded by Lieutenant Cecil Sewell, was with the 3rd Battalion Tank Corps at Frémicourt, France. 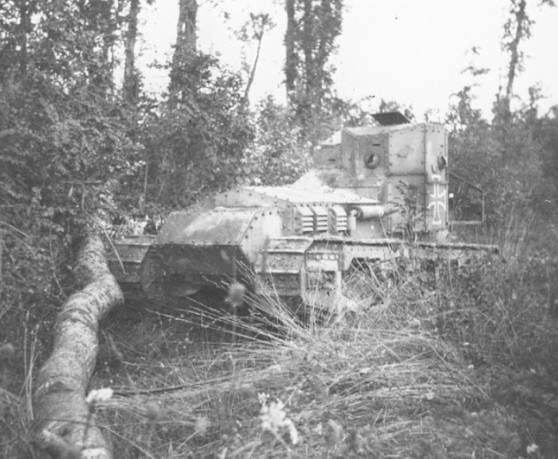 During this action, a fellow tank had slipped into a shell hole, overturned and caught fire trapping the crew inside. 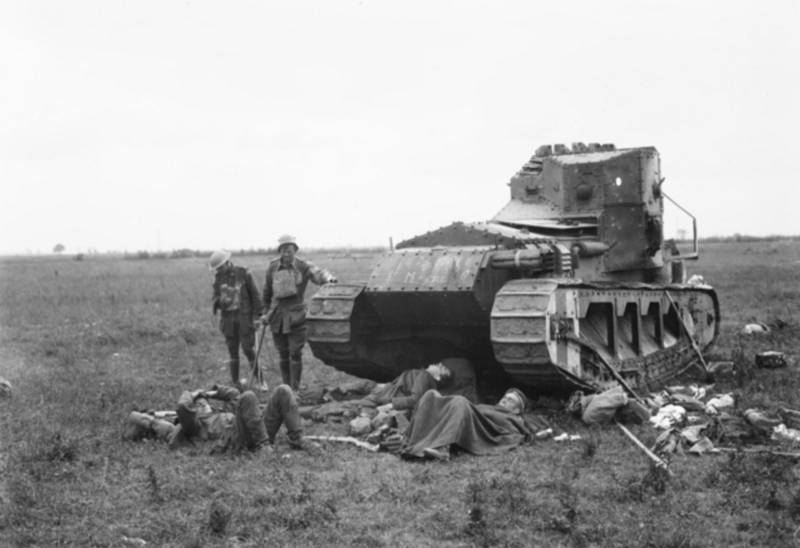 Sewell stopped his tank and ran out across open ground in full view of enemy fire digging out the door of the tank so the crew could escape a horrible fiery death. His own driver was wounded in this time and he went to his aid but was hit by enemy fire while doing so. Nonetheless, he got to his driver and while rendering medical aid was hit once more, this time fatally by enemy fire. For his heroism and total disregard for his own safety Lt. Sewell was awarded the Victoria Cross. A final and more minor note of interest is that in combat in March 1918, A226 ‘China II’ resorted to borrowing a single infantry Lewis gun to replace battle damaged Hotchkiss machine guns, so, on at least one occasion, a production Whippet did use a Lewis gun. Despite the Whippet having been designed and been up and running as a prototype in a very short time the pressures of mass production had meant that delivery of the Whippet was rather slow. 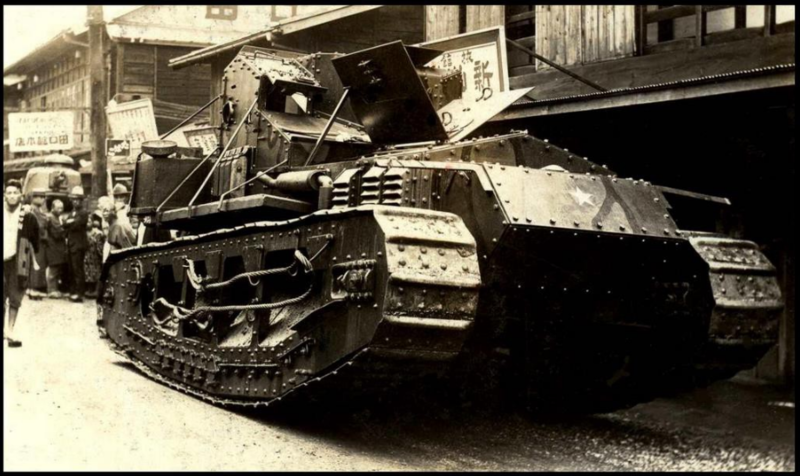 The tank itself wasn’t really of any use in combat until 1918 and although the Whippet was proven to be quite useful in combat the flaws in the design were apparent. The machine guns were prone to jamming and the armor was vulnerable to anti-tank rifle fire. The steering was awkward at best and dangerous at worst. The habitability of the vehicle was very poor and the poor driver had his work cut out steering and getting a good view of the path ahead. 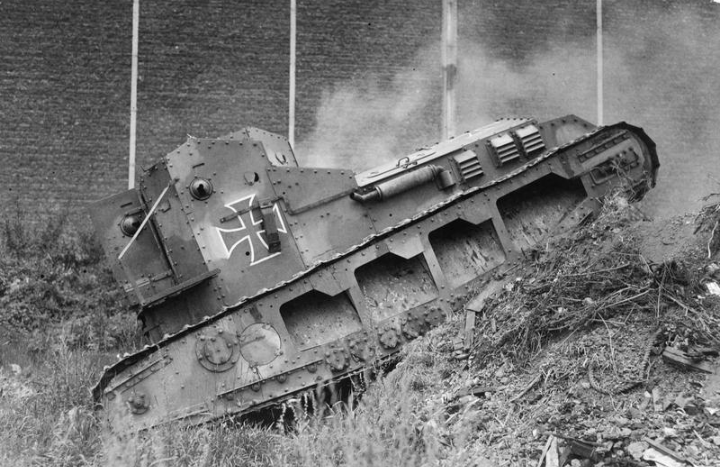 The Germans, though, who had captured at least two fully functional vehicles, were by all accounts impressed with the speed. 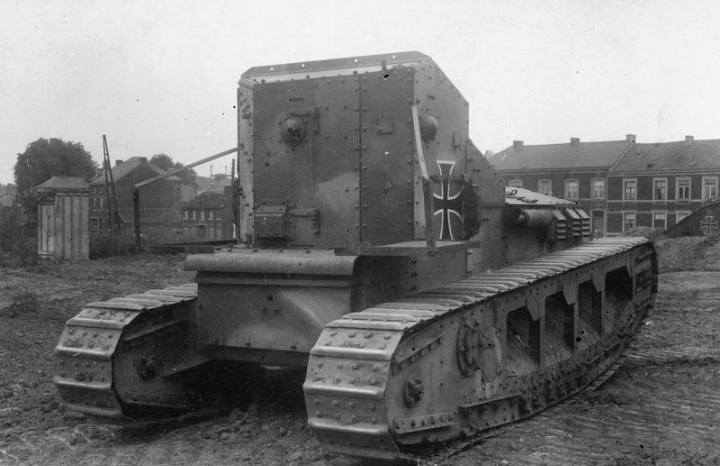 Obvious parallels are drawn between the German LK II vehicle, which was still in the pre-production phase at the time of the Armistice, and the Whippet. Quite how much influence it had on the design is still debated. One particular variant of the Whippet which sadly led to nothing was a modification carried out in 1918 by Colonel Philip Johnson. The unsprung Whippet with the 6 Skefco roller bearings was modified by means of fitting leaf springs transversely beneath the hull. 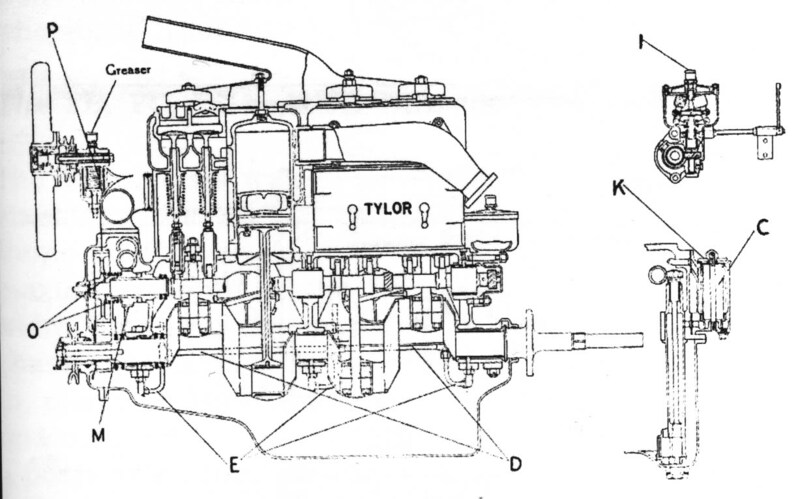 The twin 45hp Tylor engines were replaced with a single V12 Rolls Royce Eagle petrol aero engine and the Walter Wilson designed transmission from a Mk.V just visible in the lines of the rear of the vehicle. The new larger engine is shown by the much larger front hull shape with the lines of the original size still visible. 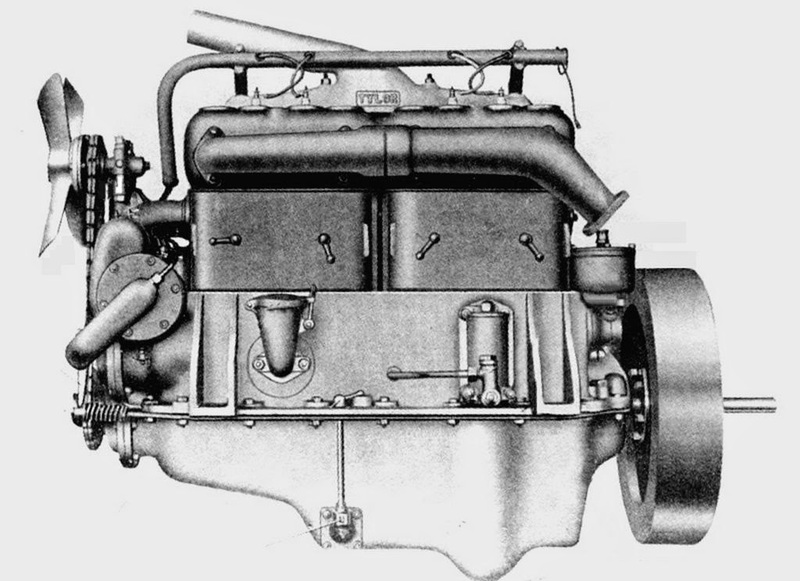 With this new spring suspension and much more powerful engine this vehicle was capable of 30 mph (48 km/h) and retained the same polygonal superstructure of the original. Sadly this machine was a dead end for the Whippet as it was just too expensive, Colonel Johnson though went on to other projects. One final oddity for the Whippet in British service is this vehicle which was handed over to Commander Baynton Hippisely RN for some experiments in Bath, England. Bayntun Hippisley was born in July 1865 and retired from the Army in 1913. His family was well-to-do with an estate at Ston-Easton, near Bath in Somerset. 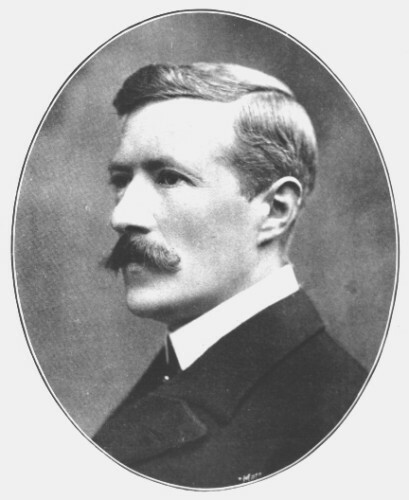 At the outbreak of WW1 Hippisley, who was considered an expert and pioneer in the use of wireless telegraphy was recruited by Naval Intelligence. He was given the rank of Commander (RN) (Temporary rank listed 17/12/1915) and set to most secret and vital work intercepting wireless communications from German U-boats and Zeppelins. 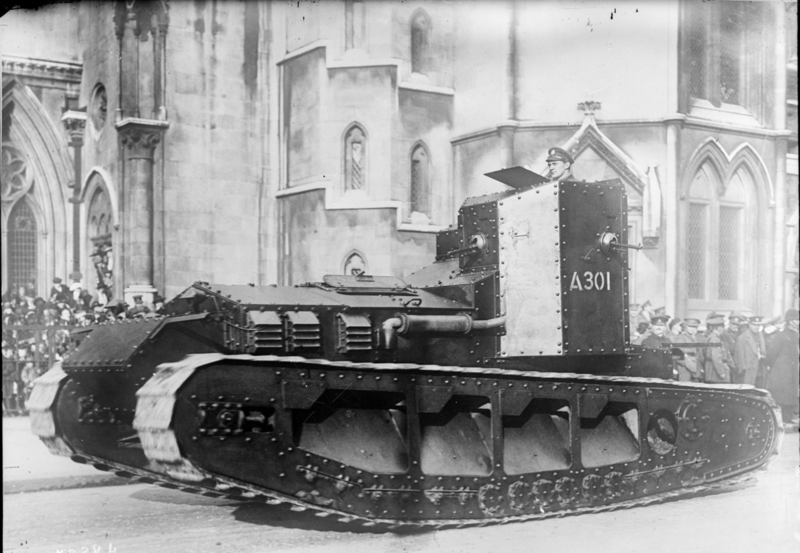 During the war, he was personally issued a Whippet tank for “tests of a secret nature” on his estate. 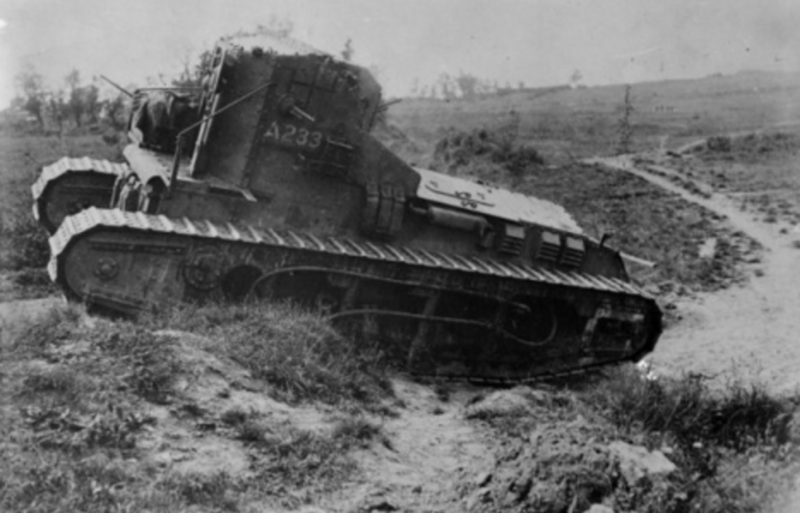 The vehicle concerned is recorded by him as being A381 which is known to have served with the 6th Battalion Tank Corps in October 1918 when it received some damage and was immobilized. The nature of the experiments Cmdr. Hippisley conducted is not clear and the vehicle had no obvious external differences to a standard Whippet save for some bullet scars. It’s possible that he was primarily occupied with wireless work with it but with the end of the war he seems to have made use of it more as a tractor on the estate maintaining the engines and hauling timber and trees or pulling them down etc. 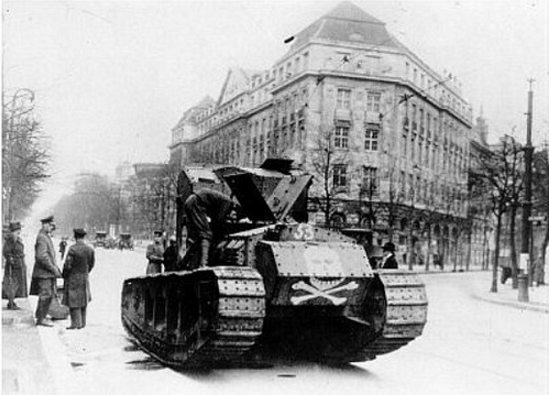 The vehicle remained with him until March 1936 when he states that he received a letter from the War Office officially disposing of it and giving it to him as a free gift. He had already received for his war service an OBE (Order of the British Empire) in 1918 and in 1937 the CBE (Citizen of the British Empire). 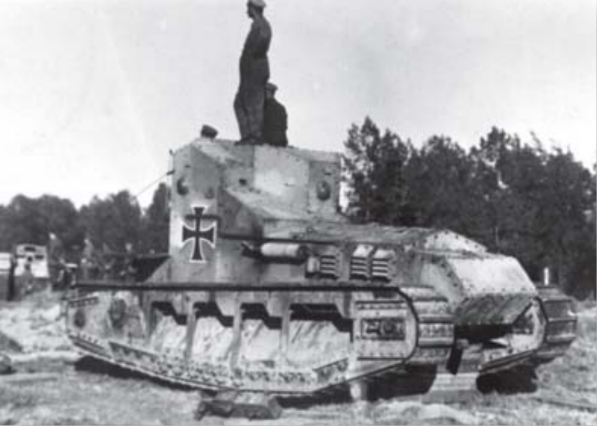 The tank appears to have been the last operational Whippet tank too when sadly in 1942 at the request of the Ministry of Work and Planning it was sent for scrap for the war effort. 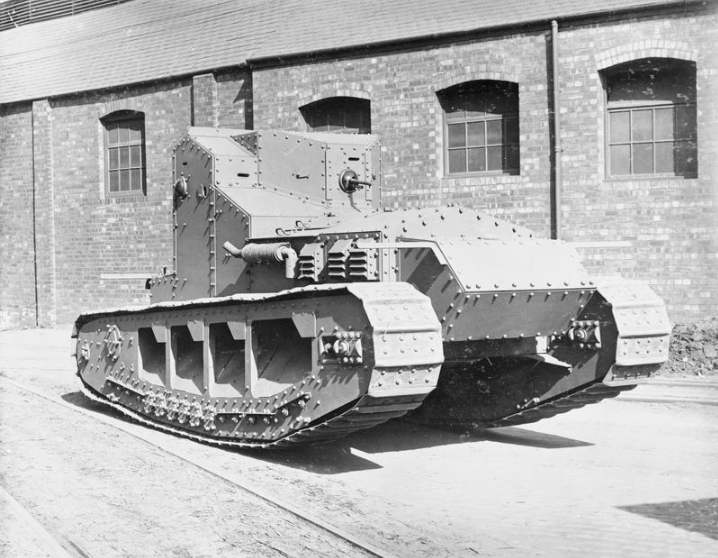 Despite the success of the Whippet in combat and the potential work like that of Colonel Johnson had shown, the Whippet wasn’t going to be built anymore. 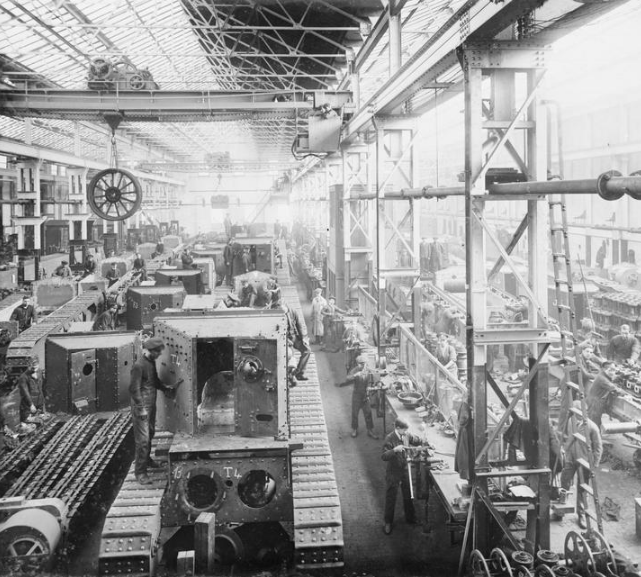 Tritton already had his own improvements in mind and the Whippets left over after the shooting war on the Western front ended in November 1918 were progressively decommissioned. Many were scrapped or sold off. 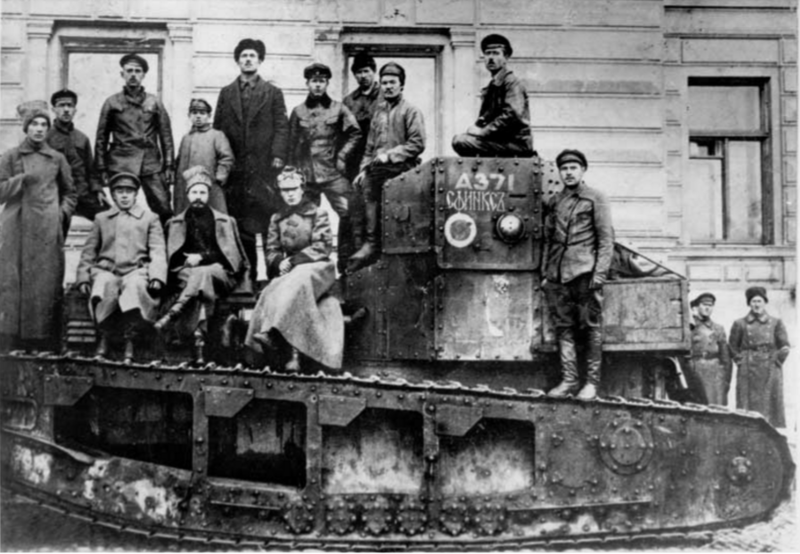 17 vehicles were deployed/sold off to the white Russian anti-Bolshevik forces but to little avail with an initial 6 sent to General Deniken followed by 11 more in July 1919. 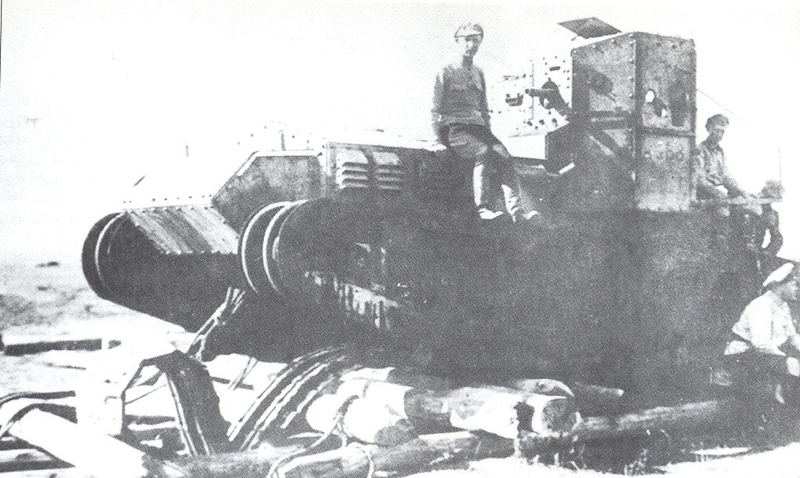 Either destroyed or captured during this bitter civil war, at least one vehicle was rearmed by Bolshevik Russian forces with a 37mm gun. Russian Whippet rearmed with a short barrelled 37mm cannon in place of the forward facing machine gun. Noteworthy is that this vehicle still retains on the nose the White-Red-White British markings. The markings were also commonly repeated on the front ‘horns’ of the vehicle on both sides and on the top of the engine to assist aircraft. On the horns, the vertical bands are 1ft (30cm) wide each. 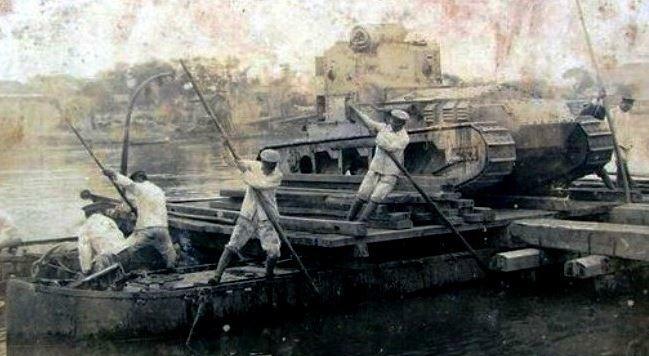 In Russian service, the last of the Whippets disappears in about 1922 presumably to scrap although in Russian service they were known as ‘Tylors’, or ‘Teiylors’ after the brand of engine. 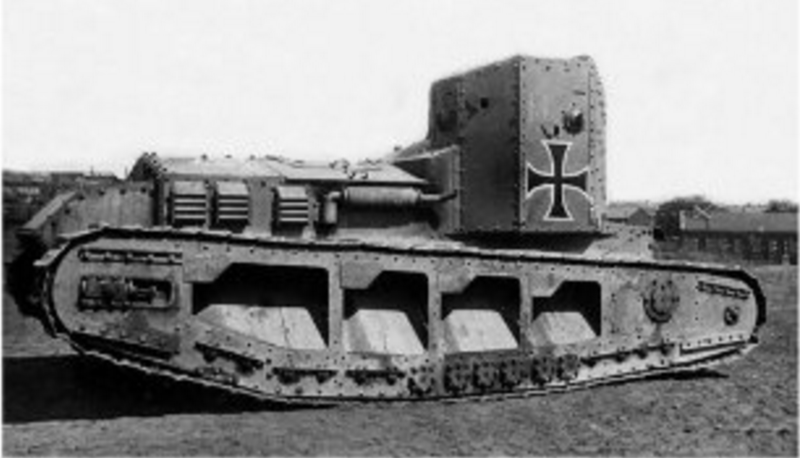 One of the first Mark A in operations, in March 1918. A late Whippet, A259 “Caesar II”, now in the Bovington tank museum. The A347 “Firefly” of the sixth battalion, B company, one of the numerous “X-companies” attached to larger units made of heavy Mk.IV and V during April-May 1918. This one is now displayed at the Royal Museum of the Army in Brussels. 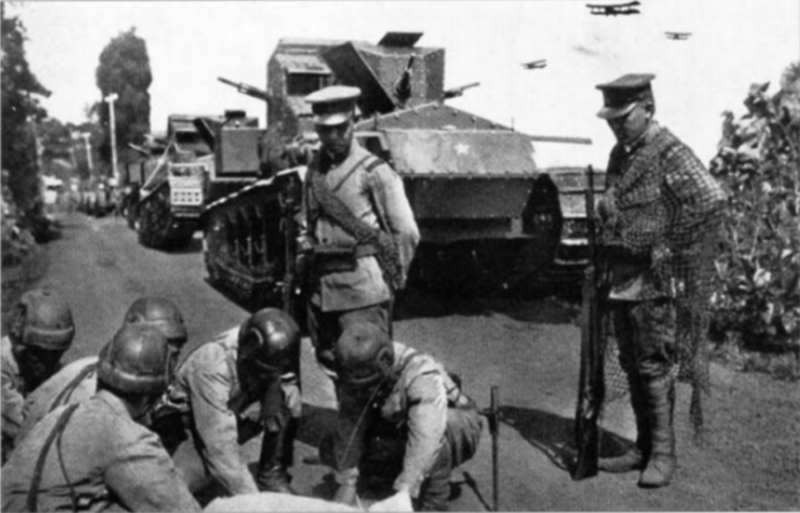 White Russian Whippet “Sphinx” with Wrangel’s 1st tank division, 2nd Det. South Russia 1920. As previously mentioned, the Bolshevik Russian forces had made use and modified their captured Whippets. 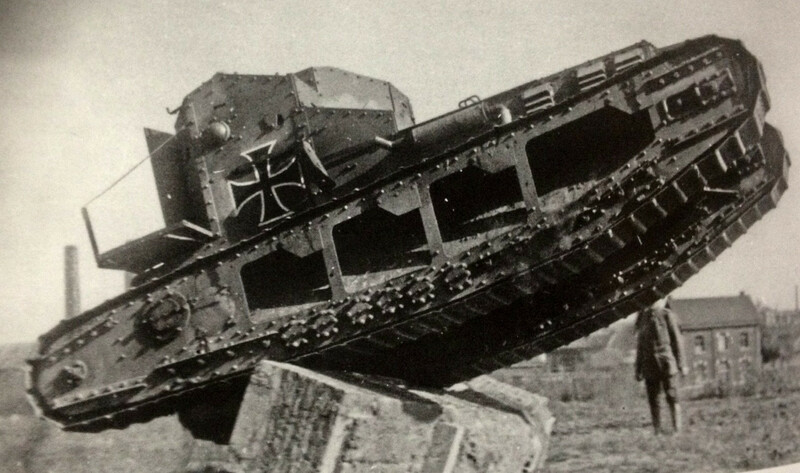 The Germans who had captured at least two fully functional vehicles in 1918 put them both to use. One (A220 shown previously) was subjected to numerous trials. 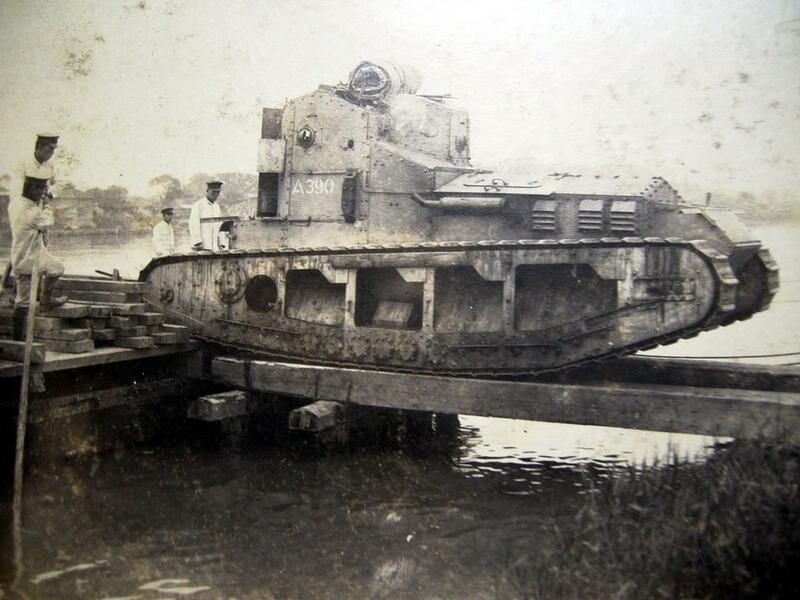 The other vehicle, Whippet A249, which had been captured at Bray, France (South of Albert) in March 1918, was shipped back to Germany where it ended up in the service of the Freikorps following the armistice. 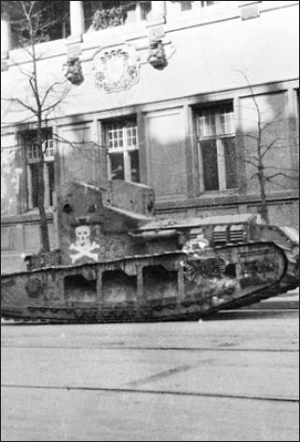 Another view of Whippet A249 in Freikorps service in Berlin post war. Note that the large skull and crossbones has been painted over the large black cross on the side. 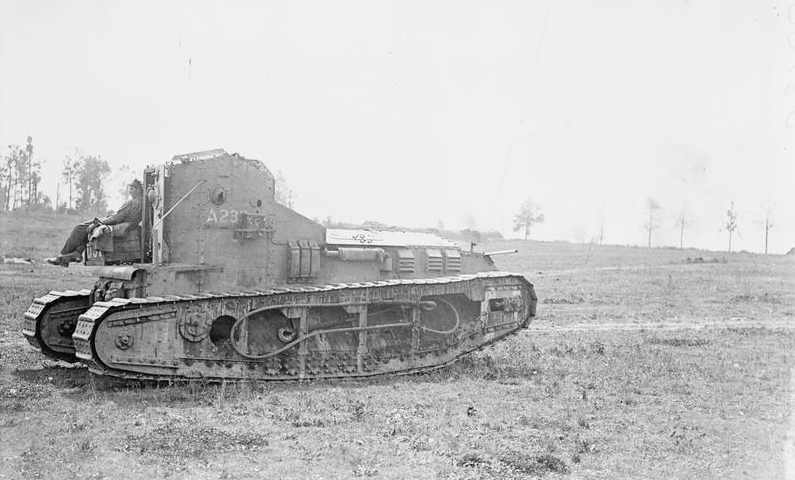 A249 was eventually taken back into allied hands in 1919 and presumably scrapped. A variety of views of Whippet A220 captured by the Germans along with A249 at Bray in March 1918. 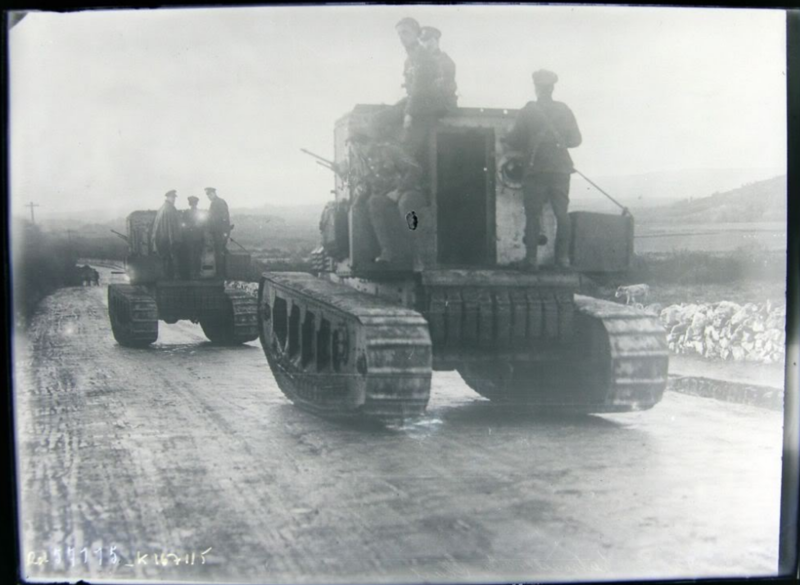 Subjected to a variety of tests this vehicle was presumably taken back by the Allies the end of 1918. One vehicle was purchased by the government of South Africa. A387 was intended to be a memorial and to be used for fund raising events and was named ‘HMLS Union’. HMLS Union however was to be no idle memorial. 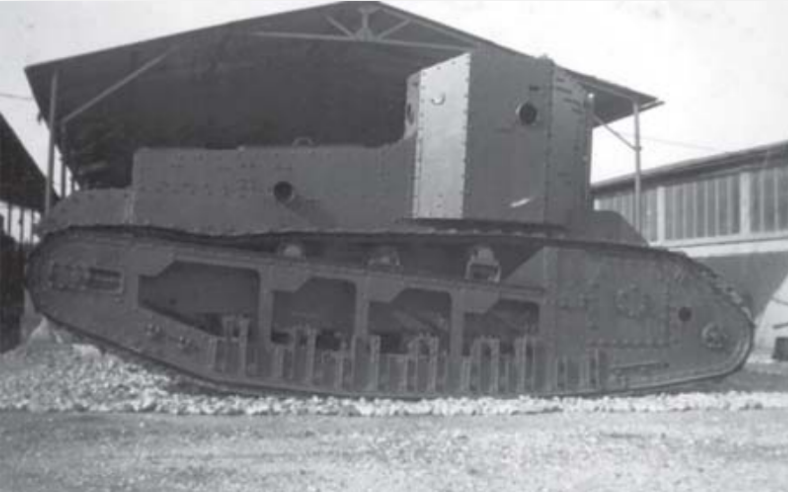 She was used as a tank during the Rand Rebellion in South Africa of 1922 where it was committed during the assault on the headquarters of the rebels. 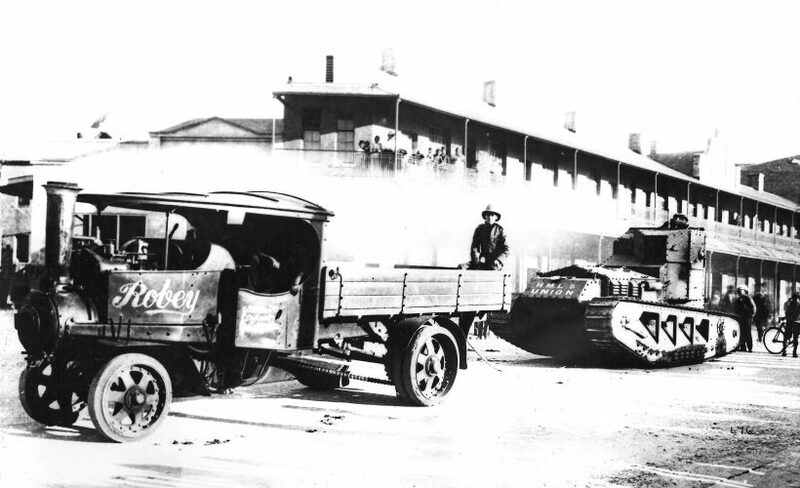 During this it became either stuck or broke down and was subsequently recovered by means of a steam truck. Following the restoration of order HMLS Union appears to have gone back into retirement until 1939 when she answered the call of empire once more in one final hurrah for King and Country. 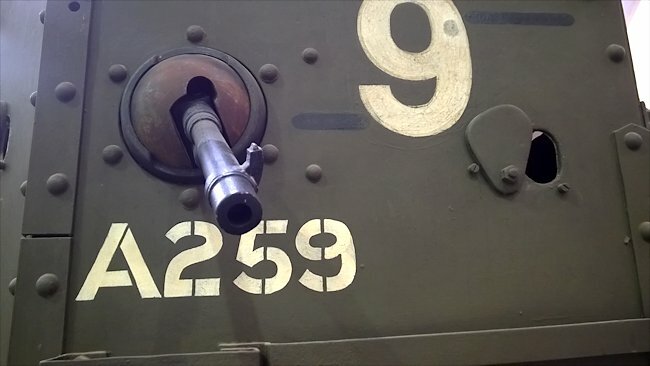 She came back to serve but was never deployed to combat, thankfully because HMLS Union is one of the very few surviving Whippet tanks and is currently on display in Pretoria. 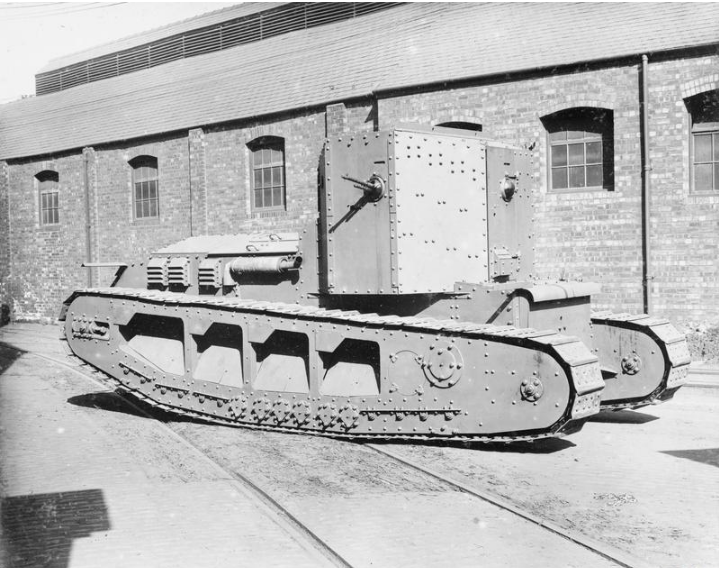 In September 1918, a further 4 Whippet tanks, A370, A386, A390, and A391 were sold to the Japanese complete with some track spuds. The only notable change made was the addition of a separate hatch for the driver allowing him a better view during a road march. A390 during river crossing exercises. No armament appears to be fitted. Three unidentified Whippets (the fourth is out of shot) in Japanese service on a road march. All vehicles display a small Army emblem Star on the nose and are fitted with the standard Japanese army 8mm machine guns. Note the view of the modified drivers front plate which is now a moveable hatch improving vision and no doubt ventilation too. Closer inspection shows what appear to be hoops of some description around the exhaust possibly to help keep netting off it. A tow cable is neatly fastened to the right hand side of the lead tank. A very detailed photo of an unidentified Japanese Whippet with what appears to be an extemporized running board on the right hand side held up with straps. The metal brackets for the canvas mud guards are still fitted so this modification may be more to do with carrying troops or stores than to prevent mud being thrown up. 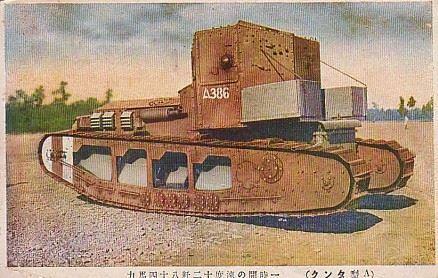 Colourised picture of A386 in Japanese service, presumably shortly after delivery as the British markings are still on show. 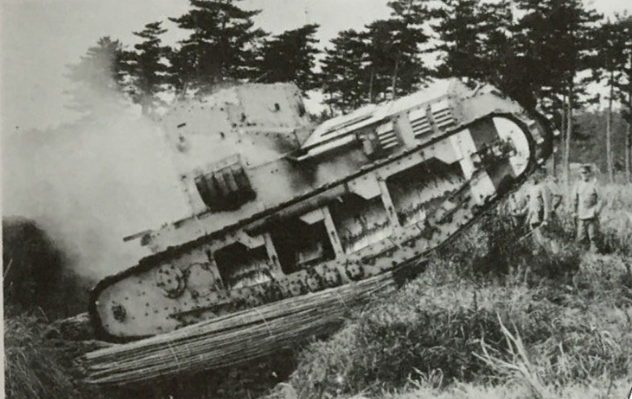 These Whippets remained in Japanese service until 1922 when they were scrapped presumably worn out despite having been provided almost new from the UK in 1919. There was no license to produce them in Japan anyway and they were large, under armed and rather clumsy. 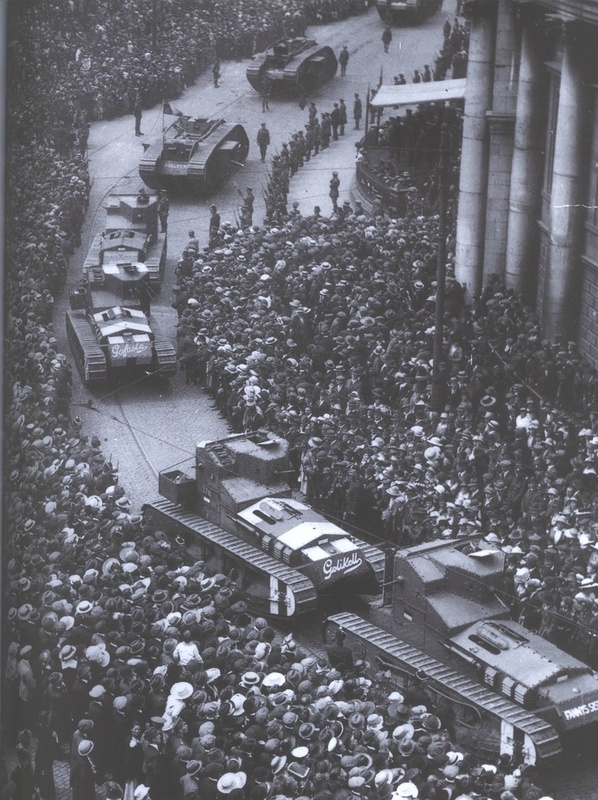 Dublin victory parade July 1919. Four Whippets took part; A230 GOFASTA [Go Faster] previously known as ‘Cynic II’, A378 GOLIKELL (Go Like Hell), A351 Fanny Adams, and A289 Fanny’s Sister. Noteworthy is the fact that two of the vehicles still retain the full engine deck paint White-Red-White markings for aerial observation purposes. The official guide was that a 1 foot White, 2 foot Red, 1 foot White band of color was able to be seen at 1800 feet and was to be painted on the roof of the cab. Here painted on the engine cover is clearly larger than that officially recommended. 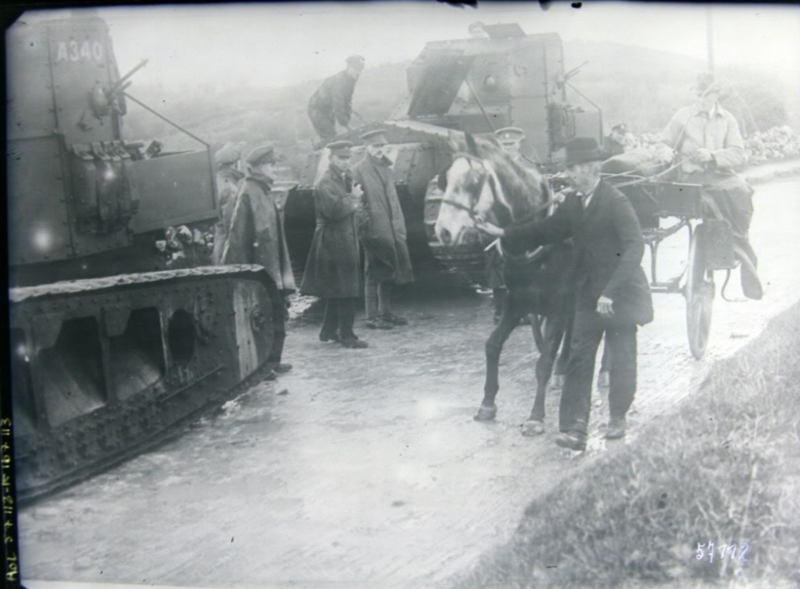 By May 1922 it seems all of the Whippets deployed to Ireland were withdrawn as Ireland descended into civil war. 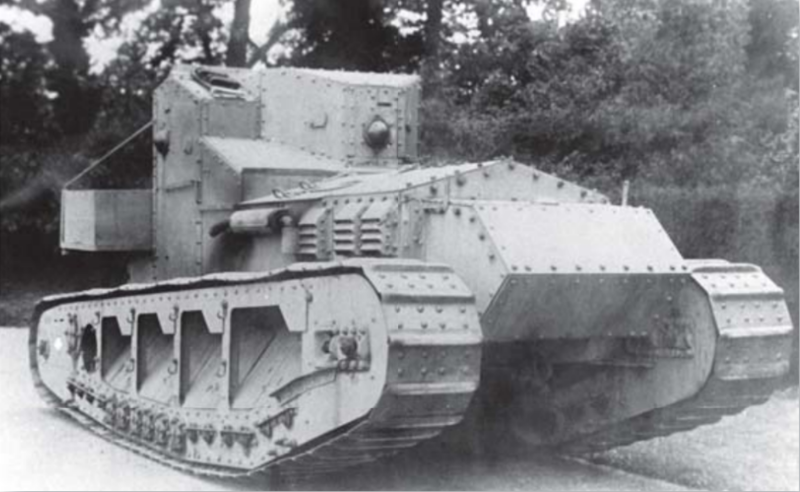 The British still had some surplus Whippets available in July 1924 and had negotiated a somewhat exorbitant price of ‎£5000 per vehicle for 3 tanks to the government of Romania. 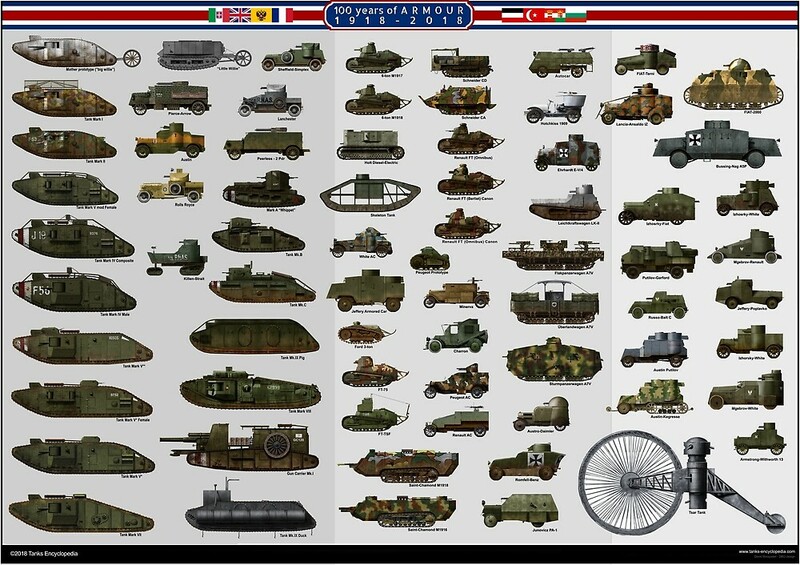 The vehicles were to be officially sold as ‘scrap’ from left over war stock but the Romanians estimated with just 2-3 months work they could be in service. The deal though never took place as the British government inexplicably never approved the sale. 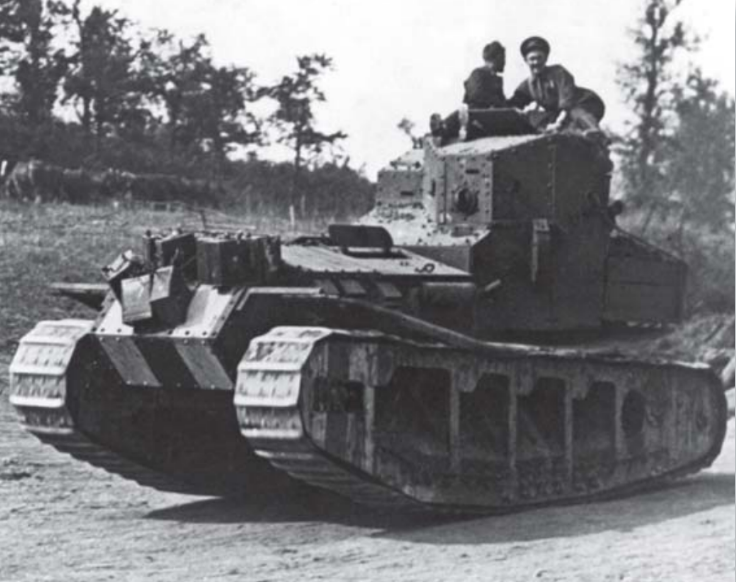 It is perhaps a testament to the success of the Medium Mark A that it is almost completely referred to as ‘The Whippet tank’ rather than by its official name. 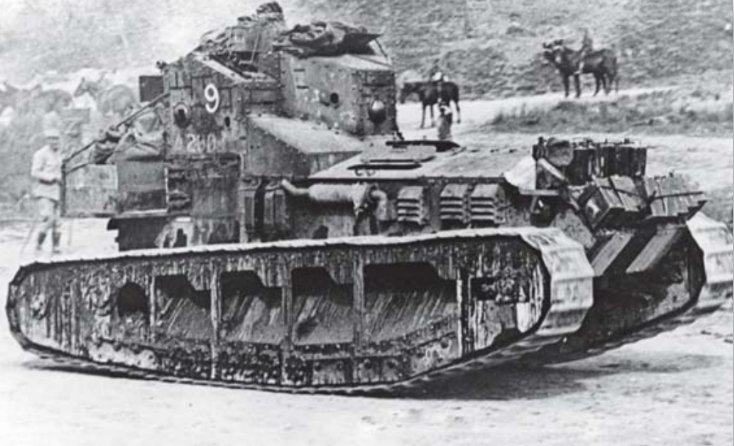 The first use of the name ‘Whippet’ is on the front of the Tritton Chaser itself and such a success the vehicle was that during the war even the later Renault were sometimes called a ‘Whippet’ tank too. 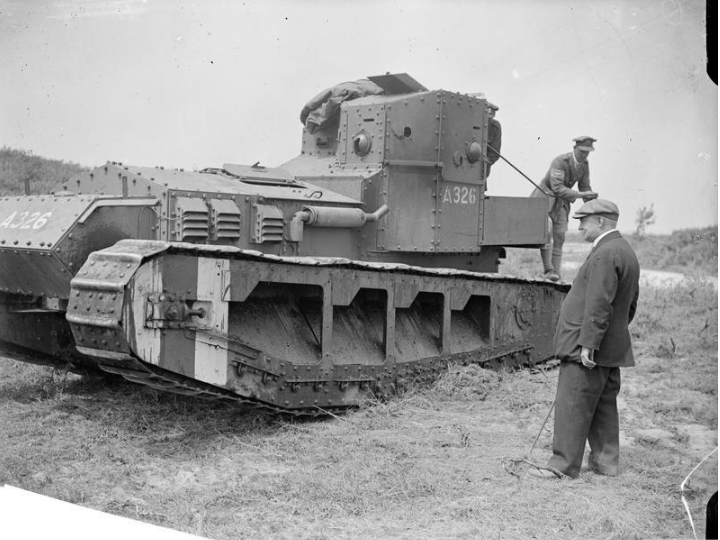 In a British parliamentary debate in July 1927, Viscount Sandon asked the Secretary of State for War if he would “consider restoring the designation whippets, as used officially during the War for small tanks, in place of tankettes, unless the former term is still used to represent a particular type?” The reply from Commodore King was that “The nomenclature of the various types of tanks is under consideration.” The name Whippet though generally drops out of use by WW2 although can still be found on occasion referring to light vehicles including the occasional armored car. 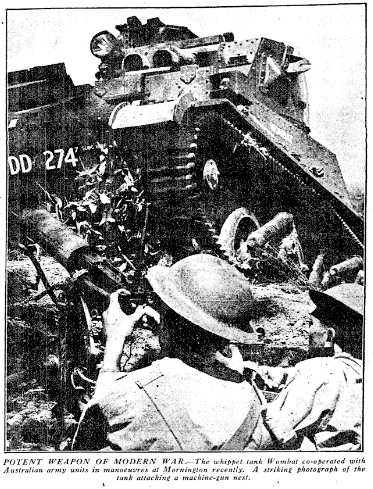 There was even an official British suggestion in 1940 to regroup light tanks into a ‘Dog’ class of vehicles by which time all the Whippet vehicles were officially marked as ‘obsolescent’. 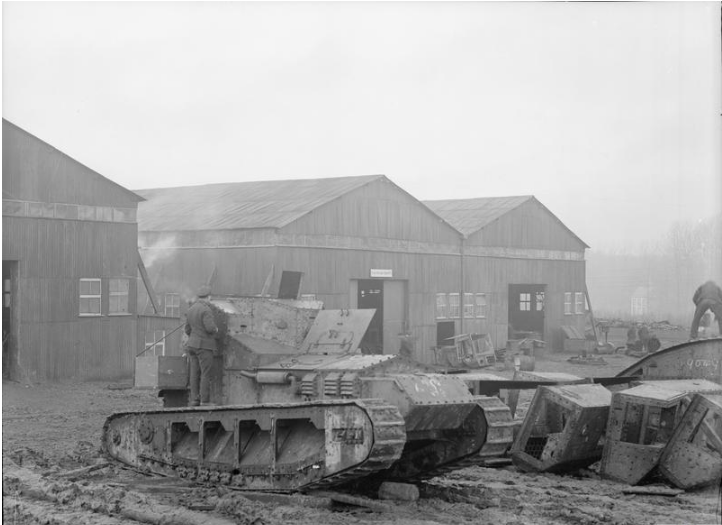 Despite 200 being built, today there are just five surviving Whippet tanks in Belgium, the USA, Canada, South Africa and the United Kingdom. Those “Whippets” on the postcard look suspiciously like Renault FTs.